Great beer. Fantastic from the tap at the Eagle Brooke Saloon and pretty damn good out of the bottle. It is sweet but finishes crisp to balance it out. Drop a few blueberries on the foam, watch them float around and enjoy this fine ale. This beer pours a light straw, yellow color. The head was brilliant white with reddish-purple from the fresh blueberries floating in it, and lasted for quite a while. The aroma is pleasant with a fairly strong blueberry nose. A little bit of malty sweetness is also present. The mouthfeel is crisp and refreshing with a little bit of sweetness and plenty of carbonation to balance it. The floating (sinking and rising) blueberries look great in the glass and at the end, are a truly delicious carbonated snack. There is a definite blueberry note on your tongue throughout the beer. Overall, this is delicious and a great beer that you can have a few of with buddies. It is very pleasant and VERY refreshing. It is certainly not overly serious for a beer, but nonetheless, I would most definitely drink it again. A- Poured from the tap with a thin creamy white head, which exhibited some impressive lacing throughout the drink. The body was a well-carbonated clear golden-yellow color, with a handful of fresh blueberries at the bottom of the glass. S- Smells like a fresh stack of blueberry pancakes. Amazing. Never smelled any beer like it. Fresh biscuity malt aromas, combines with just the right concentration of blueberry aroma. T- Amazing. Tastes more like a fresh blueberry muffin now. Cakelike malt, juicy blueberries, yet it finishes dry. A perfect example how a beer can exhibit a lot of fruitiness in the absence of sweetness. There is a nice mild hop bitterness that emerges midway and lasts through the finish, just to remind you that it's beer and not a muffin! M- A thin body- highly attenuated with a nice spritzy non-bloating carbonation. D- Super drinkable. Quaffable even. I'm not a huge fan of fruit beer, but this one is making me a fan... and I know that the wife would love this one too! Pours a solid yellow with a decent white head and some lacing. Some light malt scents, a little yeast, but the good natural scent of blueberries is prevalent. It gets a 4.0 because it smells natural and is not overpowering. Nice stuff. Some bready and light sweet malt flavors, with a hint of bitterness, but the blueberry shines without being being overly powerful or syrupy. One of the better of this style, by far. Lighter bodied, with decent carbonation, even for a growler (which can be hit or miss). Overall, a nice light fruity summer brew. Fridge is full of growlers right now (admittedly, way too much beer in big containers open). First had this stuff on tap in the mid-1990's after a long day of work in the Big House. Took me 15 years to get back to it. Worth the repeat visit. If you like the style, go for it. I urge everyone in driving distance of the actual Saloon to give it a try. I drink most of my blueberry beers in the summer, but when a friend offered me a free fresh growler of this beer I couldn't pass it up. The beer pours a slighly hazy straw color with a big stiff white head on top. The foam dissolves slowly to a thick ring around the surface leaving behind a lot of lace on the side of the glass. A blueberry aroma with just a hint of biscuit malt greets you before each sip. This light bodied beer is dry on the palate. The flavor is well balanced and very easy to drink. It's mainly blueberry with some biscuit malt in the background. It finishes with a mild hop flavor. The blueberry flavor and some hop bitterness linger for a bit in the aftertaste. This is a beer you could drink all night. I'm not sure what the alcohol percentage is, but my guess is it's light (3 or 4%). A great session beer. nice golden/orange color with a nice and fluffy rather quickly dissapating head. nice lace. aroma, blueberry obviously, a fairly strong bluberry scent. taste: nice and light. had some blueberries in the fridge so i threw a few in. very nice hoppiness with a blueberry taste that is very pleasant in that it is not overly done. far superior to the very sweet overly flavored wachusett which is the other blueberry i tried. this makes it very drinkable. overall another excellent offering from mercury. very refreshing on a summer day, so grab a growler! Pours a hazy orange-gold topped with a two finger off-white head, leaves rings of lacing. Blueberry and biscuit in the aroma. Blueberry is more restrained in the taste than most in this style. Can still taste some light malt, and a bit of floral hops. Light-medium body, not something I'd bother drinking again. Listed as Ipswitch Blue on the beer menu at Sunset Cantina. Served with fresh blueberrys in the glass. Mmmmm... Tastes like blueberrys. Very smooth and balanced. Better than other blueberry ales that I've had. It was a nice treat to get to the blueberrys at the bottom of the glass. 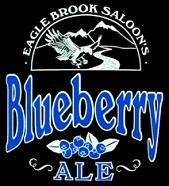 If you like blueberry, or fruity beers, order a pint of this one. Also lovely by the growler around town.